In 2016, the Trondheim, Norway-based crust punk/grindcore band Forræderi released their new EP, “A Monument to Misery”, through D-Beat Hjerte Records (an independent record label and distro from their home country). Although I haven’t previously encountered the band, tags like the aforementioned genres intrigued me, and I found myself pleasantly surprised once I decided to check out the 13-minute effort by this DIY band. 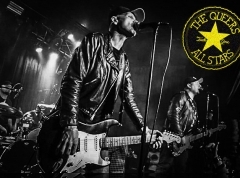 Not only is the record fast, aggressive and atmospheric, but it also has a mind of its own, with several lyrics about corrupt politics, greed and inequality — all the ingredients needed to make a decent punk record. The band’s agenda is quickly presented through the intro to the album-opener and title-track, “A Monument to Misery”, as police sirens and a news reporter can be heard over the sound of drums getting progressively louder. The raw, raging guitars and d-beats then push the song forward until the chorus ”A MONUMENT ---- TO MISERY!” is yelled from of the top of the two vocalists’ lungs. Upon repeated listens, it’s hard not to jump around and scream along, especially as the final words of the song ring loud and true: ”We keep on repeating the same mistakes”. Kudos to the band for grabbing the listener from the get-go with a killer combo of energy, rawness and catchiness. Several times while listening to the EP, I can’t shake the feeling of incoming black metal, what with all the tremolo guitar playing that hurls itself unto the listener in songs like “Social Isolation”, or even the slower, more atmospheric notions of the melodic guitar playing in the excellent “Scaling the Summit”. But while both that and the title-track are accomplished, fleshed-out songs, some of the remaining tracks on the EP pale in comparison. “Drukner” has an excellent jaggy guitar melody and “Ingen Vei Tilbake” is quite the sucker-punching outburst, but the other material needs something more than just good melodies and nerve to make it in the end. “A Monument to Misery” is a great, interesting and promising EP from an up-and-coming Scandinavian band in an under-appreciated genre, which mostly flourishes in underground DIY communities. The production is bare, the vocals are grim and the music is grinding punk on the border to black metal. 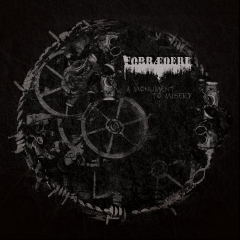 Yes, there’s definitely a lot to like about Forræderi’s new EP if you’re into bands like Discharge or Hexis, and even though the record still needs an extra push and some tighter song-writing here and there for the band to make it in the long run, it’s worth it to check these guys out.